The Tribest GS-1000 Greenstar Basic HD Twin Gear Juicer has all the basic juicing and food processing equipment. Some accessories which are not frequently used have been excluded so we may offer an economical price.It can also process whole foods, making favorites like almond and date pie crusts, pates from nuts and vegetables, sauces from a vast array of ingredients, baby foods, frozen fruit desserts and more. 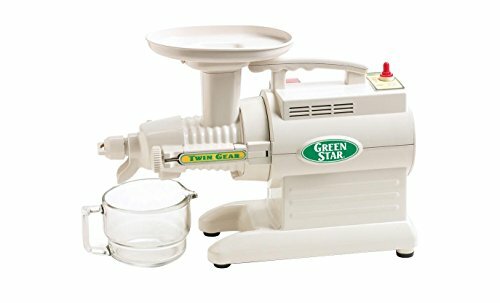 The Greenstar Original still reigns as the top masticating juicer today. It yields more juice at a low speed, ensuring that you waste nothing from your fruits and vegetables. The HD Twin Gears with 24 stainless steel masticators delay oxidation due to its bio-ceramic and magnetic technology?extracting a greater amount of vitamins and minerals from your produce. Built to last, the Greenstar Original will get the job done for all your juicing needs. Easy pressure adjusting knob. Carrying handle. Automatic pulp ejection. Fine engineering. Sturdy and practical. Classic design. HD Twin Gears. Low, quiet speed of 110 RPM. No heat build up. Bio-ceramic & Magnetic technlogy. Preserves nutrients. Higher yield of juice. Durable and portable. Easy to assemble. Easy clean up. Minimal noise.